What is Student and Youth Travel? Student and youth travel is the packaging of travel products and services for age groups ranging from elementary school to young professionals. Students and youth often travel for the primary purposes of participating in educational opportunities, leisure activities, cultural experiences, musical and art performances, and/or sporting events. 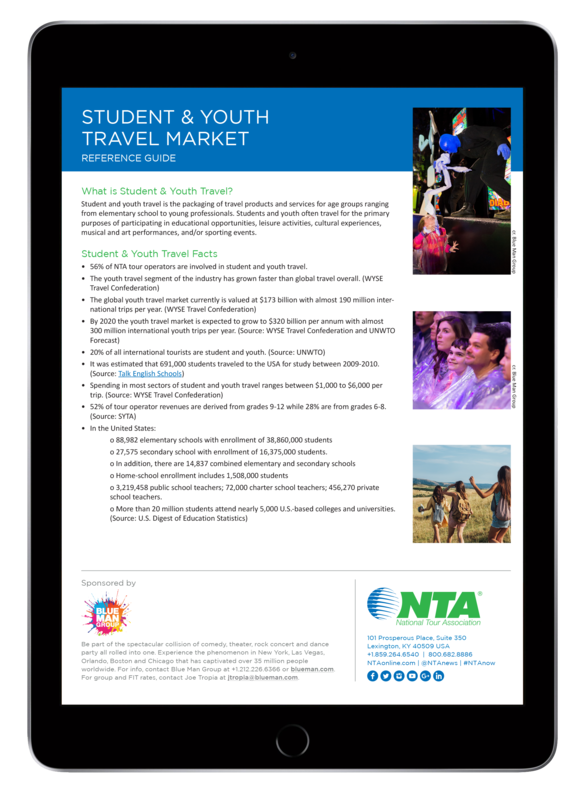 56 percent of NTA tour operators are involved in student and youth travel. 3,219,458 public school teachers; 72,000 charter school teachers;456,270 private school teachers. Growth factors in student and youth travel include people traveling at younger ages, increased student population and travel programs becoming a more common expectation and practice among school systems. Travel is a source of education as well as career and self-development for students and youth. Students and youth want to become engaged when visiting destinations and attractions. Students and youth utilize the newest technologies when traveling. Be part of the spectacular collision of comedy, theater, rock concert and dance party all rolled into one. Experience the phenomenon in New York, Las Vegas, Orlando, Boston and Chicago that has captivated over 35 million people worldwide. For more information, contact Blue Man Group at +1.212.226.6366 or visit blueman.com. For group and FIT rates, contact Joe Tropia at jtropia@blueman.com.